Suicide Squad had a chance to set a corrective course for DC’s burdensome, heavy-handed approach to creating a movie universe along the lines of Marvel. Christopher Nolan added the right dash of reality to create an extra layer of excitement and texture to The Dark Knight trilogy. Nolan’s approach has become the model for comic book movie success and Marvel’s applied it to achieve spectacular, popular results. Then came Zack Snyder. He bogged it all down. With Batman v Superman, Snyder went too far down the path of adult-themed graphic novels. Sure, those publications have a niche audience, but it’s one that doesn’t translate into wider big screen appeal. A jaded Batman who’s resorted to killing villains isn’t the stuff of optimistic inspiration that fuels sustained box office success. Here, Snyder is an executive producer while David Ayer (Fury) joins the fray as writer and director, basing his screenplay on DC comics essentially dating back to 1987. It starts off with lots of promise, picking up right where Batman v Superman left off. Metropolis is coping with life without Superman and contemplating what’ll happen when the next Superman comes. Will he be friendly? Or will the next one be a terrorist? Well, Bruce Wayne (Ben Affleck, Hollywoodland) is making sure Gotham (and... okay... Metropolis, putting aside that bitter football rivalry... and the rest of the world (why not branch out of his discomfort zone?)) is prepared to handle what’s next and he’s lurking in the background hunting down meta-human baddies for prison — or an otherwise grisly demise — while gathering meta-human goodies for the Justice League. In that regard, Suicide Squad serves as a bridge from Batman v Superman to next year’s Justice League release from (unfortunately, it would seem) Zack Snyder. Here’s the premise, basically. Desperate times call for desperate measures and an initiative led by Amanda Waller (Viola Davis, The Help) is given the green light. The plan is to use the worst of the worst, incarcerated meta-baddies, to help fight terrorism and other ugly situations. Among their ilk are a crocodile man, a loony Australian with a fetish for pink unicorns, a sharpshooter, a fire starter and a psycho chick. The latter notwithstanding, it’s not exactly DC’s A-list of villains. Terrorism. It’s loosely bandied about now, to the point where it’s lost gravitas. In the DC cinematic universe, it’s boomeranged from a palpable threat led by Bane in The Dark Knight Rises to something squarely in the realm of the comic books: A mystical villainess named the Enchantress (Cara Delevingne, Paper Towns) has the power to turn regular men into faceless soldiers with nothing more than a kiss. What’s to keep those supervillains from skipping town in the face of such danger? Well, they’ve had a tiny explosive injected into their system. If they stray or make a bad decision, they’re toast by way of a truly killer app. Given that as the underlying framework, Suicide Squad plays like some kind of 1980s mashup between Escape from New York and Ghostbusters. But it’s still missing the fun factor DC movies desperately need. Black lives, blue lives. All lives. They matter. But what about meta-criminal lives? Ayer could’ve done so much more to capture the angst of the times, but instead terrorism, mental illness and standard villainy are meshed together into a borderless, meaningless straightjacket. What is needed here is more of the swagger and irreverence of Deadpool. Not that Deadpool was particularly great, but it offered a different tone, to say the least. As it happens, Suicide Squad has a guy named Deadshot instead of Deadpool. Deadshot (Will Smith, Concussion) is the most sympathetic of the villains in this lot; he simply wants to spend time with his young daughter (aww, shucks) in between sniper shootings. But it’s Margot Robbie (The Legend of Tarzan) who performs a solo heist and steals the show. 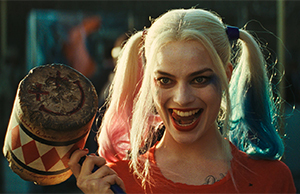 She slays it as Harley Quinn, a messed up hottie who’s madly in love with the Joker (Jared Leto, Dallas Buyers Club). Plans are afoot for a Harley Quinn solo movie; with so much potential there having Robbie in the role, maybe that’s when DC will finally get the mojo going and add a little swagger back in its cinematic steps. As for the Joker, he’s borderline inconsequential in this story. He’s not a member of the Suicide Squad, he’s an outlier, a wild card more than a Joker. There’s nothing particularly new in this incarnation to allow Leto to come out from the dark, imposing shadows cast by Jack Nicholson and Heath Ledger. It’s a shame. There’s a lot of wasted potential, given the cast is well set throughout and there’s enough entertainment value lurking in the mire to tease of a great counter-culture, subversive movie that might’ve been. It could’ve been a real game-changer, one to upset the order of the comic book movie machinery with a different take on the entire genre. These are people who are interested in seeing your business and what you have to offer. We have tons of repeat customers in almost every niche. Would you like a new online business to add to your existing one? Dropshipping is a great addition for any website owner. Our limited edition drophipping websites are designed to sell. No cookie cutter same old sites here. Our sites are truly appealing to buyers. Free hosting, domain and social media marketing plan. Would you like 5,000 to 12,000 visitors coming to your website in one week? These are people who are interested in seeing what you have.